The Leisure 29 was designed by Frank Pryor and is identical to the Leisure 27, but with two feet added to provide a larger cockpit. The skeg and rudder were also re-designed. About 30 Leisure 29's were built, the majority being fitted with twin keels. They proved tough, roomy, sea going boats. The hull is built in solid GRP with foam ribs and stringers for exceptional strength and minimum maintenance. The deck is in balsa sandwich for maximum insulation properties. The hull has either twin bilge keels, or a fin keel, with a moulded skeg and rudder. Tiller steering is standard but some were fitted with a wheel. The moulds were later used by Jaguar Yachts to produce the Lynx 29. The non slip moulded deck is clean and uncluttered with a flat foredeck for safe anchor handling. High topsides give an immense amount of room below with full 6ft 1½ in headroom throughout, making this a really dry boat but without creating excess windage. Double lifelines run through stanchions from a butterfly shaped pulpit to the pushpit. teak handrails are fitted each side of the coach roof which is fitted with four ventilators for the main saloon, toilet and hanging locker. Black anodised aluminium toe rails, incorporating four fairleads run from stem to stern. A combined stem head roller and fairlead is fitted. A 25lb C.Q.R. anchor is standard, stowed in a anchor well with a two piece hinged hatch. Two deck mounted halyard winches, and two speed sheet winches and cleats are standard fittings. All standing rigging is in 6mm stainless steel wire, shroud chain plates are anchored to internal steel brackets through bolted and bonded to the hull. Halyards are internal to the mast and run direct via deck mounted turning blocks to winches and cleats. The standard engine was a 7.5 hp Volvo diesel Saildrive unit which was never powerful enough and some boats were fitted with the larger twin cylinder 13 hp engine. A twin battery installation is standard. In later years the Leisure 29 moulds were used by Jaguar Yachts to produce the Lynx 29. 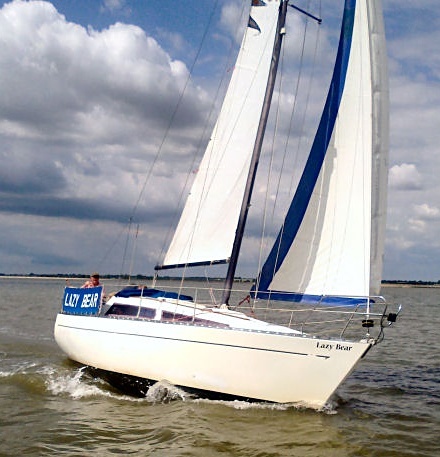 Except for some minor differences in internal trim (including the use of light coloured internal mouldings) the Lynx 29 is virtually identical to the Leisure 29. Down below the cabins are fitted out in teak veneers and quality furnishings. Double lined throughout, the interior has long tinted windows which make the saloon light and airy by day. The companion way steps are easily removed to give access to the engine. The basic arrangement is a dinette which will seat five people in comfort with four more on the berth opposite. A separate toilet compartment, and hanging locker are fitted between the main saloon and fore cabin. A full galley is fitted with cooker, sink and icebox. Seawater and freshwater pumps are standard. No complete brochure for the Leisure 29 was ever published. There was only a simple "flyer", see below, that accompanied the Leisure 27 Brochure. Leisure yachts (bar the Leisure 17) are seldom raced. The only yardstick information we have is aRecorded Number (RN) from 1982(published by the RYA on the basis of limited information).